Prophet has been tested and is homozygous for pinto and black so can he can not sire any solid coloured or chestnut pinto offspring. He has the classic teddy bear temperament that this breed is renowned for. He exhibits heavy bone with loads of feathering, is short backed with apple rump and gorgeous head and is a true gypsy in every sense of the word. His ancestry goes back to "The road sweeper" and "Toy Boy" both famous Gypsy horses. The stallion will be a great cross for any bred, injecting type, color and most of all a calm even temperament into your foals. If you are looking to bred a safe child's pony, sport horse, a pleasure riding mount or driving pony then bred to a gypsy. 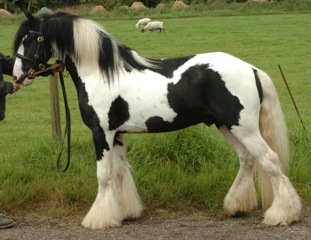 The Gypsy horse is known as the horse for all the family. Prophet is registered with New Zealand Gypsy Cob Assn. $2000 for pure bred mares. all plus gst.